This Saturday, June 16, the weather is supposed to be perfect for a garden tour. 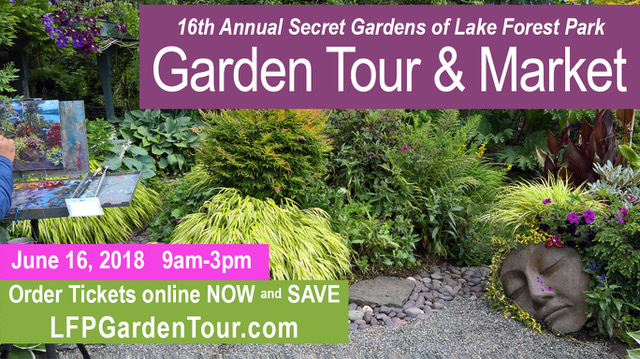 So, get your tickets now for the 16th annual Lake Forest Park Garden Tour. The tour includes access to six local gardens. Ticket holders on this self-guided tour will be able to see ways local gardeners have solved challenges like drainage, slopes, shade and sunny spots ... Strolling through six local stunning gardens you will see how to attract birds, and divide space to encourage contrast and variety. Each garden will have a musician and an artist in the garden. The proceeds of the ticket sales are returned to the community through support of four local non-profits. Half of the proceeds from the sale are used for public art in Lake Forest Park. The Garden Tour contributed to the art at the Blue Heron Park bridge and commissioned and donated the piece in front of City Hall. There will be a garden market in the lower level of the Town Center, selling plants that will thrive in our local environment. You can learn how to keep bees, and purchase flowers, plants, and garden art. Tickets are available online or at Town Center Hardware or Wildbirds Unlimited in Lake Forest Park Town Center, intersection of Bothell and Ballinger Way.